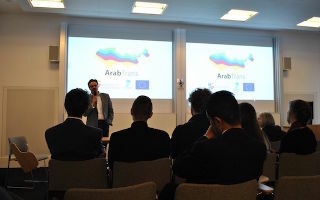 The European Commission funded project “Arab Trans” holds a policy event on the 8th of September 2016. The event has taken place at Scotland House in Brussels, Belgium. The event showcased the key findings of the projects extensive data and analysis. Munqith Dagher delivered the opening address, followed by four presentations from – Andrea Teti, ECIA Senior Fellow and leader of the project, Francesco Cavatorta, Pamela Abbott and Valeria Talbot.